As I mentioned in this post, I'm just in love with rose toned lip products lately and that rosiness hasn't just influenced my lipsticks. 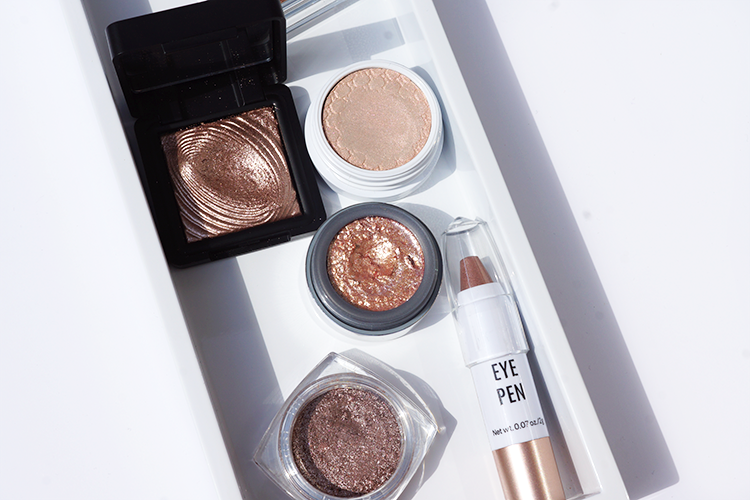 No matter your skin tone, rose gold on the eyes will frame and flatter, and I've got a handful of my favourite picks to share with you today - let's have a peek. Etude House Bling Bling Stick in 08 Ivory Baby Star £5 | I'm a huge fan of eyeshadow sticks/crayons as they're so damn easy to use and travel around with. A warm golden shade with a rosy undertone, Ivory Baby Star from Etude House is creamy, pigmented, smooth and reflective, looking different in different lights. It takes longer to set than the instantaneous gel liners you might be used to so I like to work in light layers and build it up - excellent value for a mere £5. 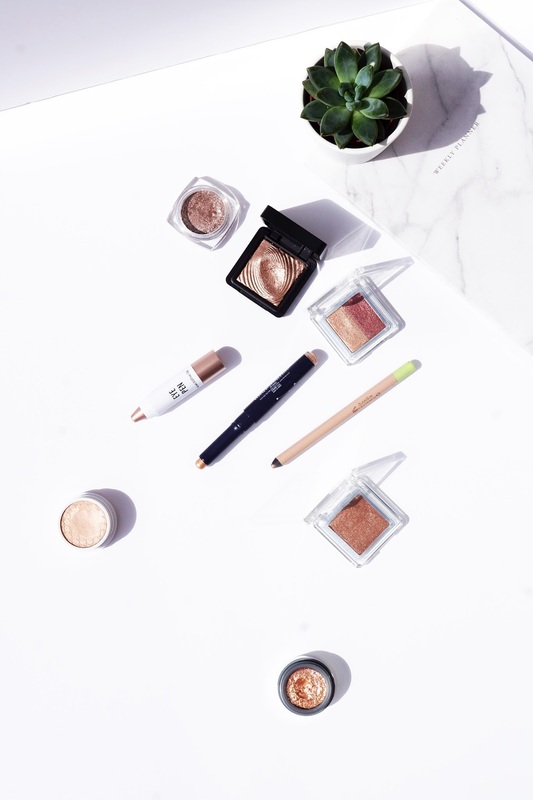 Pixi Endless Silky Eye Pen in Oysterglow £12 | A pale rose gold-come-champagne, the formula of these gel-style eyeliners is an absolute winner for me - they're so creamy, pigmented and legitimately budgeproof. As I don't have much lid real estate, I love using this all over the lid and quickly blending out the edges before it sets. It's also perfect for the inner corners. Kiko Water Eyeshadow in 200 £8.90 | This is definitely the shadow everyone needs to own, whether you're pale or dark skinned, this will flatter. The formula is pigmented and really versatile, you can use it wet or dry depending on the intensity you want. I like to use this with my fingers as I find it's application most smooth that way. Colourpop 'Puppy Love' £11 | Not strictly rose gold but a lovely accompaniment. The soft, warm peach with pinky-gold iridescence reminds me a lot of Topshop's Glow Pot in Polished in shadow form. The pigment payoff is quite sheer but buildable, and I either like to wear it alone or use it as a 'shadow topper' for other shadows to give them a little pizzazz (honestly how long as it been since you've heard that word said?). H&M Eye Pen in Gold £5 for 3 | Totally unassuming, I found these little eye pens in the original makeup area, not the new, dedicated range, and was immediately drawn to them for the colour. In all honesty, I didn't think they'd amount to anything but they're actually not bad! The middle shade, Gold, is an ever so pretty, warm, rose gold, and whilst they're not that long lasting, they're creamy, smooth, evenly pigmented and come in at just over £1 a stick! & Other Stories Eye Colour Duo in Coir Sepia £10 | This is a beautiful little duo, with a more warm, yellowy rose gold on the left and a plummy rose on the right. Even though it's a powder formula, they're smooth, even and the pigmentation is outstanding. If you haven't tried the shadows from & Other Stories, I urge you to immediately! & Other Stories Eye Colour in Raisin Vapor £7 | Another shadow from & Other Stories I love. Just as pigmented as the duo above, Raisin Vapor has a brown/pink undertone that I love and consequently ends up looking a little less razzmatazz (another word I'm dragging up to the 21st century!) than some of the others, but definitely no less beautiful. I like to wet this one and do a fat line close to the lashline with it - super flattering. Stila Magnificent Metals in Kitten £33.50 | Firstly lets say to never buy this a full price (bag it on sale or scour TKmaxx for a deal) - if you're going to spend £33, push the budget a little and buy one of these beautiful palettes! That being said, it really is stunning. It's probably the most 'bling' of all the rosy gold shadows I own and that is definitely something to relish. Mix the bouncy (it's got such an odd texture in the pot) shadow with the mixing medium in the palette and smooth onto the eyelid. L'Oreal Infallible Shadow in Tender Caramel | Don't yell at me, because you can't buy this in store anymore and I'm sorry (although you can still snag it online here)! It's worth scouting out discount beauty sites or eBay though because it's so pretty. Definitely on the cool side, compared with my other picks, the darker base with rose gold highlights looks so flattering on it's own with a good lashing of mascara, really superb in texture and pigmentation. 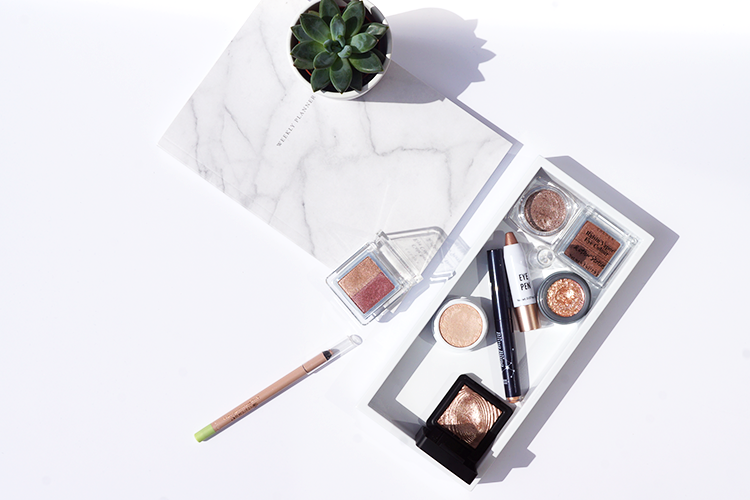 P.S I have some more rose gold favourites in my Everyday Makeup Favourites! I love rose gold at the moment, such a gorgeous shade! 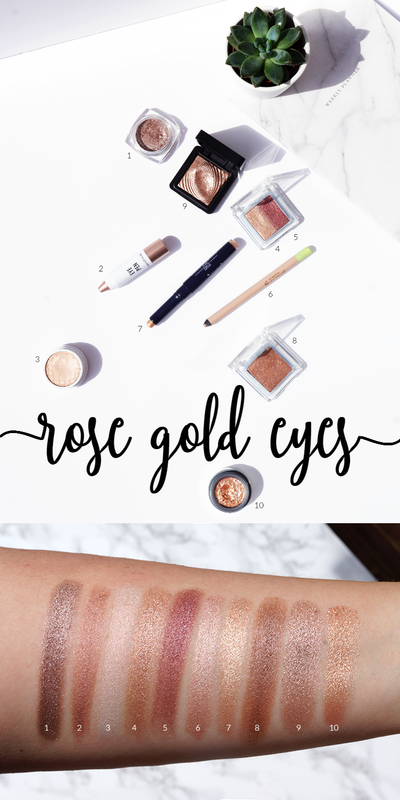 Rose gold is my go-to eyeshadow shade, so these colours are right up my street. I love anything metallic. Two of my faves at the moment are Colourpop La La and Loreal Infallible Amber Rush, they are both absolutely stunning! These are all so so beautiful, I wish I had them all! I think Rose Gold is a great colour for eyeshadow that suits almost everyone. I really want to try the Kiko one! Omg these swatches are absolutely beautiful. I'd love to try the Colour Pop eyeshadows, they look so pigmented. These are all really pretty shades. Love them! Makeup Geek Roulette. It is the dream. And a really beautiful formula, too. I think you'll like it!! Nice to meet you & kisses from Mykonos! Pretty overload! I want to try that Pixi pencil you mentioned! My favorite rosegold-ish colors are from the naked 3 palette I think! such gorgeous shades! your photos are lovely!! This is freaking beautiful..like I am obsessed staring at the pictures! All of those shades look so adorable! I really need to purchase some of them for myself! I really need to wear more Rose Gold on my eyes!! So in love with & other stories shades. So pretty. This post has made me want to go shopping for new eye shadows!! I feel I need them all! Your a bad influence on my bank balance! Goodness gracious, these are exactly my kind of eyeshadows. Loving the duo shades. Wow these eyeshadows are out of this world! The pigmentation is insane and these would all be great as one-wash shades for an easy everyday makeup look. Definitely need to get my hands on some of these!